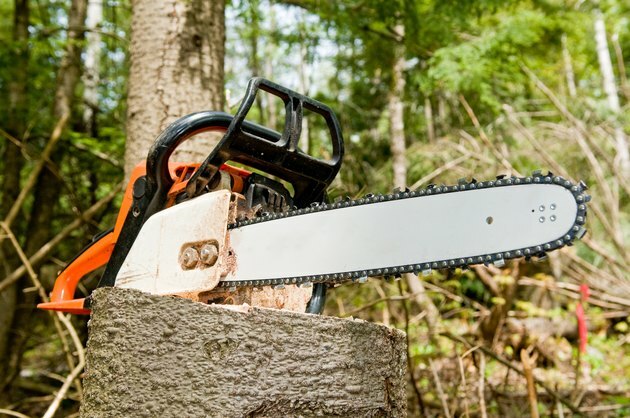 Chainsaws help you make quick work of cutting down trees, trimming large branches and dividing the trunks of fallen trees. Remington manufactures electric chainsaws for home and professional use. Although its chainsaws run on electricity, oil runs through the motor and chains to keep the moving parts lubricated. Using the correct oil keeps your Remington chainsaw running smoothly. Even electric chainsaws require oil to run well. Your Remington chainsaw takes motor oil, also known as engine oil. This keeps the engine running properly by reducing the friction as the moving parts rub against one another. The motor oil also helps protect your engine by sealing out moisture and thereby reducing the chance of rust. A high-quality motor oil also pulls dirt and dust away from the moving engine parts to reduce wear. Motor oil is graded by the Society of Automotive Engineers depending on the oil's viscosity. A lower SAE grade equates to a less viscous oil. When temperatures drop, a lower viscosity oil moves through the engine better than a high viscosity oil. For general purposes, your Remington chainsaw takes SAE 30 motor oil. If the weather is below freezing, switch to SAE 10 oil. When working in temperatures above 75 degrees, use SAE 40 oil. The oil cap of your Remington chainsaw is located on the top of the tool near the front handle and above the motor housing. Remove this cap and fill the tank with the correct grade of motor oil for your weather conditions. Place the cap back on and use a rag to wipe away any oil drips from the chainsaw. Empty the oil once you've finished working with your chainsaw. Oiling the chain keeps the links running smoothly and prevents the chain from collecting sawdust and sap as you cut. Before you make each cut, press on the oil cap. This delivers oil onto the chain. Do this only when the chain is still, not when it is running. Keep an eye on the oil level gauge located near the oil cap. If the tank runs low, stop to refill with the correct grade of oil.